Peter Atkinson and Megan McDevitt (Photograph by Michael Abrams). Ah, Wilderness! 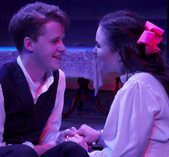 revolves around sixteen-year old Richard Miller (Peter Calvin Atkinson), right at the height of adolescent restlessness, uncertainty and disaffection with everything and everyone around him — except his beloved Muriel (Megan McDevitt). Richard fancies himself a poet, and despite the worries of his family —particularly his mother Essie (Lynn Laurence), who is horrified by his flirtations with "indecent" writers like Swinburne and Wilde. They generally care for and love him, even his newspaper-owning father Nat (Ken Trammell). But when Muriel's father comes calling, demanding Richard back off his courtship, things quickly go sideways. One of the big problems, however, is that things never go that sideways. A sixteen year old coming home drunk like his uncle Sid (Ted McGuiness)— who the play clearly means to be more charming than the way he actually comes across— might have seemed shocking for an upper middle class audience in the early twentieth century. Today, it seems curiously out of step with the far more problematic misogyny and glorification of adult alcoholism at the play's core. Sid is sort of criticized for being a drunk, but not really. Even what limited censure there is appears to be almost immediately forgotten. Indeed, any problems that crop up somehow conveniently go away. The result is a sort of uneasy disquiet for he audience. Are we supposed to feel good about this family? Were there any actual fault lines in the relationships? If so, where are they? If not, why are we watching a two and a half hour play about this boring group of privileged people? Unfortunatel direction and acting don't help these matters. Peter Dobbins' direction is ponderous, and keeping the script almost untouched does the production no favors. And most of the actors can't pick up the slack on their own: Trammell struggles with Nat throughout, jumping other actors' lines and even flubbing character names on occasion, while Laurence wildly overacts Essie's every emotion. Atkinson tries, but can't make Richard into anything more than the unlikeable, self-absorbed adolescent the play pushes his character into being. The rest of the cast is forgettable with the notable exception of McDevitt, who plays Muriel's version of adolescence much more convincingly, and Natalie Pavelek, whose spirited portrayal of Belle, a "woman of ill repute," gives the production a badly needed shot of energy. But perhaps this is the biggest problem: When the work's best parts play directly into cringeworthy, misogynist stereotypes, do we really still find madonna and whore dichotomies valid ways of representing women in 2019? It suggests that the overall play may not be suited for reclamation. Even if Ah, Wilderness! is still worth seeing,it will take a much bolder effort than the one the Blackfriars Rep has in here. At one point Nat warns Richard that if he isn't careful, "something is going to happen!" I wish the play had actually followed through on the warning. Thurs. – Sat. @ 7:30 p.m., Sat. – Sun. @ 2:30 p.m. I agree with the review of Ah, Wilderness! I disagree with the review of Ah, Wilderness! The review made me eager to see Ah, Wilderness!